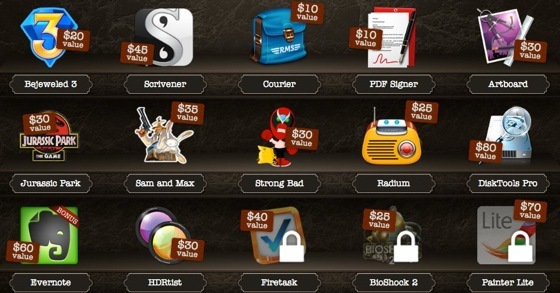 Insane MacBook Deals: MacHeist 4 Bundle offers 15 Cool Apps for just $29! Have a new MacBook and want to fill it with awesome apps right away? Looking for some cool new software to help with your tasks and productivity? Bored with your current games and are looking for a new challenge or just a different way to pass the time? What if we told you that you can get all that without breaking the bank? Have we got your attention? Great, because we’ve got a great deal in store for you today — the MacHeist 4 Bundle lets you get up to 15 incredible games and apps for just $29! That’s three great reasons right there to tell your MacBook-owning friends about the Macheist 4 Bundle. All in all these apps would cost around $539 if purchased separately but by getting the bundle, you can get it all at an insanely low price of just $29! How cool is that? Still not sold? What if we told you that aside from getting some genuinely wonderful apps for your MacBook at fire sale prices, you’ll also be doing some good? That’s right, because 25% of what you pay will go to a partner charity of your choice. To date, MacHeist, together with their customers, have raised over $2 million for different charities all over the world. By purchasing a MacHeist 4 Bundle, you’re not just getting a great deal, you’re also helping out some folks in need. That’s guilt-free shopping right there! Which of the apps included are you most excited to get for your MacBook? Share your thoughts in the comments below!